This afternoon was pretty busy around my house… I was preparing dinner for a friend, putting together a cake for Rotary, and getting ready to make a pie. As I was doing this, I was chatting with my Dad on the phone. During our conversation, I noticed that a call was coming in. When I tried to get to the caller, I realized I had taken too long to answer, but since I had their number, I called back right away. When the phone rang, Jeanie from Ashland Home Health and Hospice answered. I gave her my name and she asked if I had a family member in hospice. When I told her that a call had come in from that number, she told me that she would check with the rest of the staff. A moment later, she said no one she could find had made the call; perhaps it was an error. That’s when I told her that I had tried to find the hospice staff months ago and I had been told by someone (I can’t remember who) that there was no hospice building. What that person probably meant is that there is no special building just for hospice patients, but Jeanie confirmed that there were a great number of hospice personnel that worked from that location. Then Jeanie told me that she knew of me and my husband from when we opened Standing Stone, and that she thought I knew her sister Teresa. Yes, I did know Teresa. She was a talented artist who died far too young. Then I shared something that Teresa had once said. She had been a baker earlier in her life but had given it up because it was such a “temporal art.” I think I looked up temporal and realized Teresa was right… baked goods are only here for a moment and then they are gone leaving nothing behind. They aren’t art at all! And so tonight, I finally got to brought a pie to Ashland Home Health and Hospice. It will be consumed at their meeting tomorrow morning. I extend my gratitude to the men and women there who work to make our life transitions comfortable, peaceful and even beautiful. We are very lucky to have them. Tonight, our friend Deedie Runkel hosted a reunion for friends of Westtown School living in southern Oregon. The event was held at Anne Hathaway’s Cottage in Ashland. My husband, Emile, is an alumnus of Westtown, having graduated in 1977; his mother, Diane, is also an alum. The opportunity to meet other alumni on the west coast is rare and so we made plans to attend. An N.C. Wyeth painting, The Giant, hangs in the dining room at Westtown. It is a beautiful memorial to Westtown graduate William Engle. As I was thinking about where to give my pie today, I thought maybe it would be nice to share it with the friends that we would meet tonight. I called Deedie and asked what kind of pie might be in order for such a gathering. 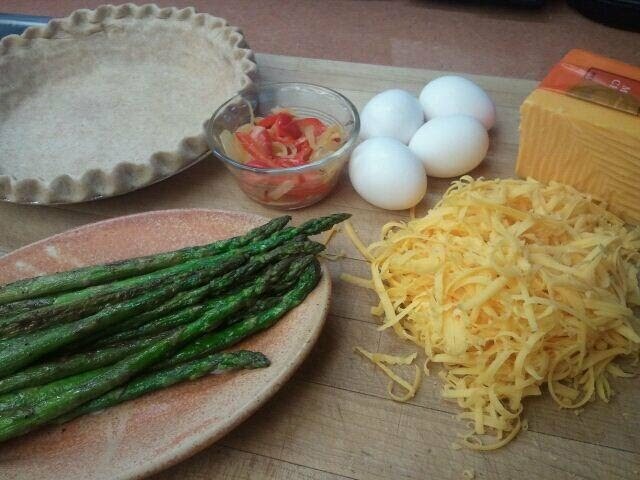 She suggested something savory, and so I prepared a ham, roasted asparagus, and cheddar quiche for the event. About a dozen friends nibbled on quiche and a variety of other treats, as we shared our memories of, and our fondness for, Westtown. 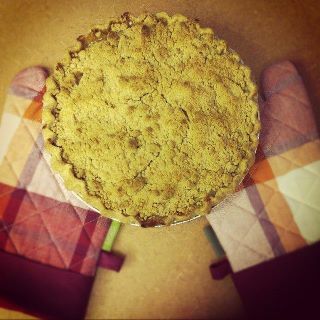 A pie shared with friends… what a perfect combination! 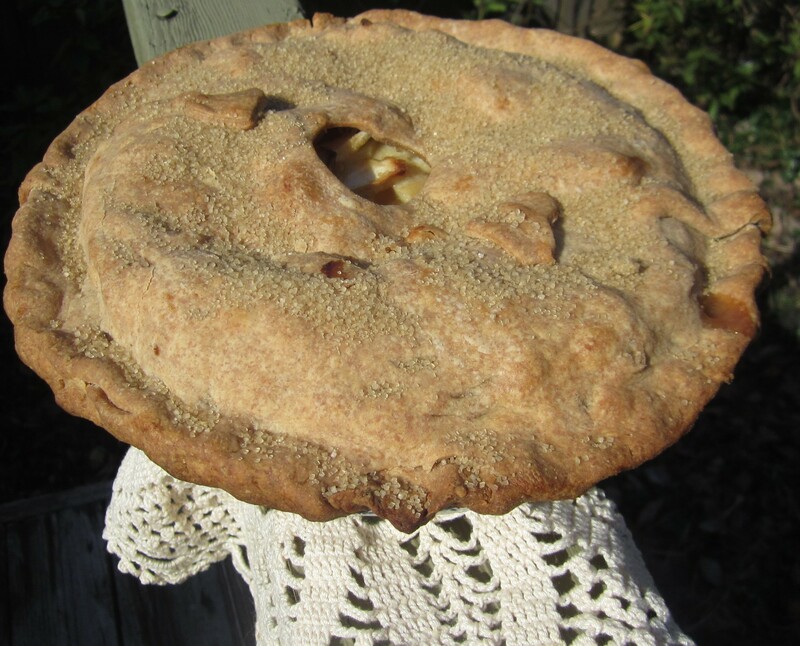 A few weeks ago a woman named Christina emailed me and told me about a friend that she wanted to gift with a pie. The friend had helped Christina with her Bible studies and she felt so blessed to have spent time with her that she wanted to do something special for her. Because of the many things that were going on in my life (a trip to Montana chief among them) I was not able to get to Christina’s request until today. 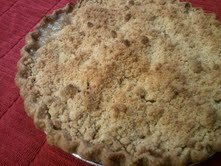 She had suggested that her friend might really appreciate an Apple Crumb Crust pie and so that is what I prepared. When it was done I called Christina to get the address for her friend and shortly thereafter I made my way to a house in Medford and delivered a pie to Christina’s friend, Lorene and her husband Gary. It was an honor to recognize Lorene for the time and attention that she had given to Christina. Clearly it had made a significant impact. I can remember a few people who offered me the same kind of consideration at various moments in my life – and know that because of their attention, my life was changed. At some point in our lives, we all will have the opportunity to give of ourselves and make a difference in someone’s life. I urge you to be on the lookout for those moments. They have the potential to be tremendously powerful and may make you immortal in the hearts and minds of those you have helped. 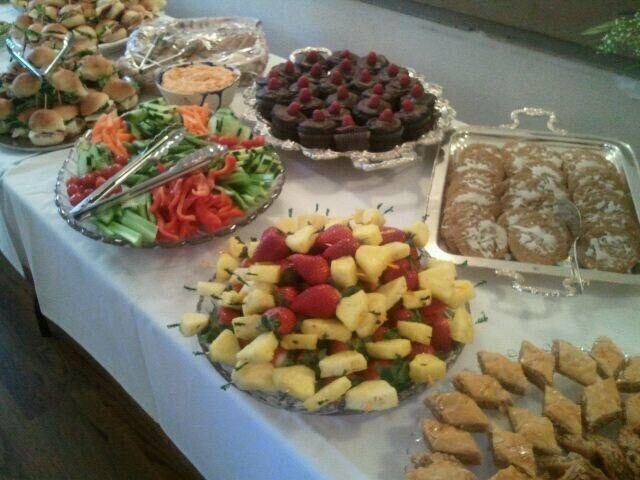 Today I spent many hours preparing food for a celebration of life service. It was my honor to do so and I was touched by the trust that had been bestowed on me. It was important to me to return that trust and so I worked very hard to make sure that everything that I made was as good as it could be. When all the preparations were completed, the celebration service began. The moderator opened with a moment of silence. Afterwards friends and family members shared their special memories about a man who was well-loved and who will be missed very much. After the service, I realized that I had yet to deliver my pie of the day. 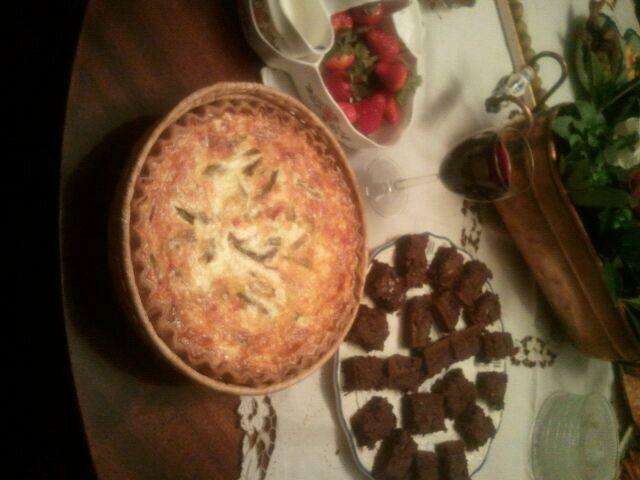 I’d made it for a friend of mine but when I called tonight, she did not answer. As it was nearing nightfall, I thought I would find someone in need of dinner and honor my friend another day. After a short ride through the downtown plaza in Ashland, I spotted several outdoor urban dwellers and parked my car. As I approached the men, I held out the quiche and asked if they would like it. Immediately they both began thanking me and said that they would bring the quiche to the church shelter to share with the others who were there. As I left, they thanked me again and wished me a good evening. As I was driving home I was struck by this thought: I put the same attention and care into the feast as I did with the quiche and it does not matter who receives our gifts; what is more important is that we use them. This morning my husband, daughter, and I went for our customary walk up Wimer Street. As we turned off Wimer onto Wright’s Creek we passed a man walking with his dog. He looked very familiar but I could not place him right away. It was only after he was long gone from our view that I realized that he was one of the guests at our friends, George and Joyce’s, annual Charades Competition – which coincidentally was being held tonight. My husband and I had not played Charades until we were invited to the annual competition a few years ago… and we needed a bit of help to get the hang of it. Once we were primed though, it was quite a lot of fun and we’ve been delighted to be invited back to play three years in a row. For tonight’s competition we were asked to bring a gift for the prize table. Prizes are usually awarded in a number of categories, for example, the fastest male and female players, the best overall score, the most expressive contestant. For our contribution to the prize table I brought a homemade treat… a Pecan Pie. When we arrived tonight I saw Jeff, the man that we had seen earlier in the day, and I found myself on his team for the “tournament.” And what a challenging game it was! There were some pretty tough clues to act out including: The Outlaw Josie Wales, Alice Doesn’t Live Here Anymore, Thurgood Marshall, and others. Sometimes the clues were guessed rather quickly, and other times it took much, much longer. But it didn’t matter if we won or lost, it was so much fun to be a part of this very creative evening. After the last clues had been played, the “winners” were announced and Jeff was recognized as the “fastest” man to act out a clue. He went up to the prize table and saw the pie and asked incredulously, “Can I really take this?” And that is how Jeff became pie recipient 325- simply because of his skill at Charades. And really, isn’t it just as good a reason as any? Yesterday afternoon my friend Katrina called and told me some news about Dave, a man that we both know. Dave has the “downtown Ashland” postal service route. He delivers mail to all the businesses downtown and to some residential customers as well. Late last week Dave was walking his normal delivery route accompanied by a supervisor when suddenly he felt something was wrong. His supervisor quickly called for help and Dave was whisked off to the hospital because he was having a heart attack! How lucky for all concerned that Dave was being shadowed that day on his route; surely angels were at work with him. Some may call this a coincidence… but I read Squire Rushnell’s book, and he calls coincidences “winks from God.” I love that explanation; it gives greater meaning to our lives when we can find “nods” from the universe. Today I visited with Dave and his wife and daughter. Just so you know, Dave will not be eating the quiche that I brought as it is far too rich. Instead, I suggested that he might try some carrot sticks or chicken soup. 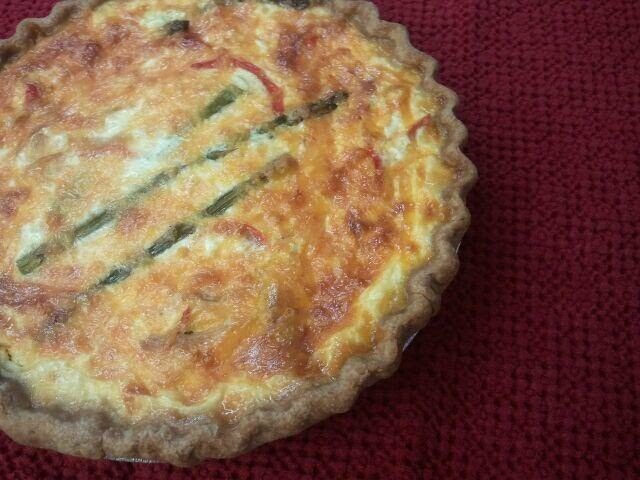 The quiche is meant for his family; so that they can be nourished and able to take care of Dave. Dave’s wife, Laura, mentioned that a three-year-old child that knows Dave sent him a note with this message, “I am sorry your heart broke.” This child knows that something went awry, but has been told by his mother told him that Dave would just need time to get better. Dave, we are sending love and good wishes your way for a speedy recovery. Yesterday I had a few pleasant surprises. In the morning I received two phone calls from friends asking if I was going to be home. They both said that they were just going to “drop something off.” Hmmm… I wondered, what could that mean? A short time later the doorbell rang. There at the door was my friend Donna. She handed me a box and said “Happy Birthday!” What? “But Donna, today isn’t my birthday…” She looked at me and smiled and said, “I know that… it’s my birthday.” Donna reminded me that last year I had made her birthday cake… and this time she wanted to share a special treat with me. 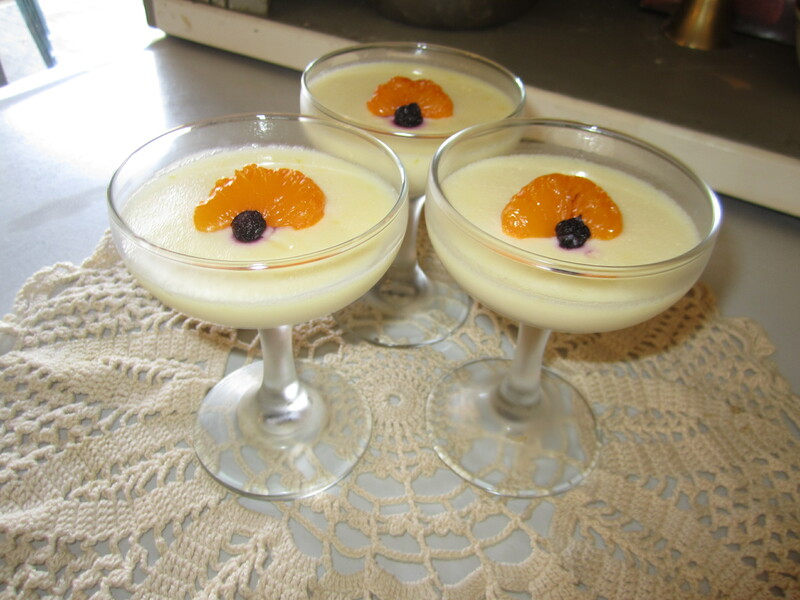 She calls it “Lemon Posset” and it is absolutely delicious! It tastes like lemon curd mixed with whipped cream… really incredible. What a delightful way to celebrate her birthday! A short while later, the doorbell rang again. This time it was my friend JoAnn. She had brought with her a brown paper bag which she then handed to me. 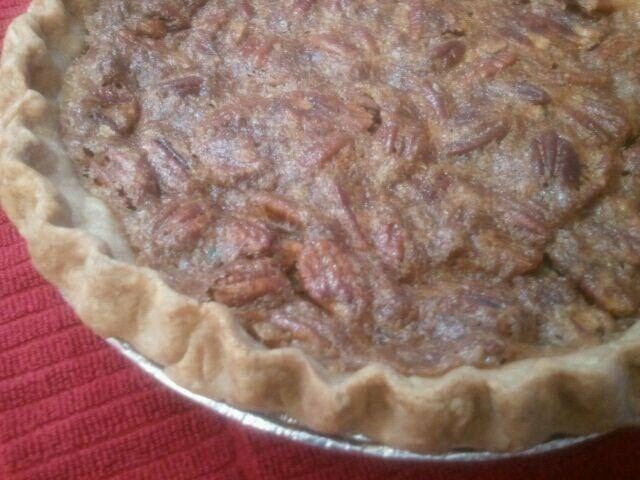 Inside were many of the ingredients for making one of my favorite treats, Pecan Pie. JoAnn said that she wanted to do something to support my pie journey and sensed that I really liked making Pecan Pies… which is true. What a wonderful gift and how generous of her to go shopping for me! I am very grateful for her thoughtfulness. The last surprise of the day came in the afternoon when a friend called to offer us tickets to “The White Snake” at the Oregon Shakespeare Festival. It was a great show and a nice way to end a day of surprises. And just when I thought I’d received more than my share of blessings, this morning the doorbell rang. It was my neighbor Jae offering me tickets to another show at the festival! How lucky can one person get? With so much goodness going on, it just seemed right to share some of my good fortune… in the form of a pie of course… with the Ashland High School Nordic Team as they prepare to compete at the State Finals this weekend. I send them all my very best wishes for realizing their personal bests and creating some very happy memories.